Wealthy ranchers John Beal Sneed and Albert Boyce, Jr. came to blows over Sneed’s wife. After more than a decade of marriage and two children, in 1911 Lena Sneed admitted to having an affair with Boyce and asked for a divorce. Sneed straightaway had her committed to an asylum. Boyce rescued the damsel in distress, and the couple ran off to Canada. 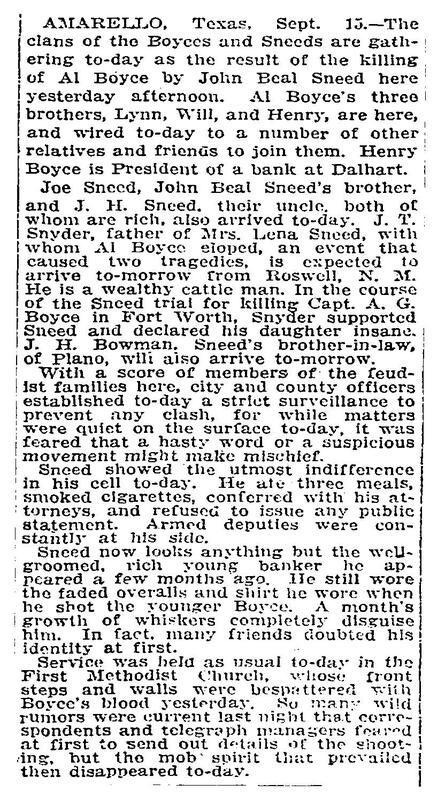 Incensed when kidnapping charges were dropped, Sneed upped the ante: In early 1912, he murdered Boyce’s unarmed father in the lobby of a Fort Worth hotel. Widely publicized court proceedings ended in a mistrial, spurring a mob of Boyce supporters to storm the courthouse and kill four men. Sneed’s father was the next to go, in an alleged murder-suicide. 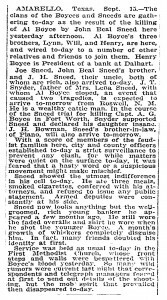 Although John and Lena Sneed reconciled in mid-1912, he could not let the insult go: Wearing a disguise, he shot and killed Boyce in broad daylight on a Fort Worth street and then surrendered at the county courthouse. Juries later acquitted Sneed of all charges, calling the killings justifiable homicide. Body count: eight. Click the image below to read the New York Times report from 1912. You don’t see reporting like that anymore!